Healthways originally introduced the Arpin Divair two hose regulator in 1954 and discontinued it in 1957. That same year, they introduced their own original design, a single stage two hose regulator simply known as "Scuba". 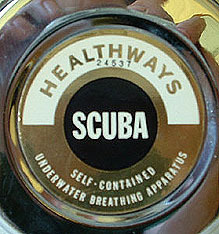 Healthways ended all two hose regulator production in about 1966. 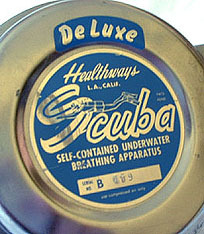 1957-1960 Scuba. The first year of production featured blue hoses to distinguish them from any other regulator on the market at that time. Healthways also used Hope-Paige mouthpieces on this first model. Note the all metal, riveted label. 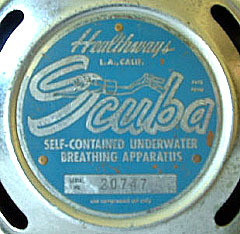 1960-1962 Scuba DeLuxe. This model featured a new case design and a new mushroom exhaust valve, but was otherwise identical internally to the older model 'Scuba'. The Hope-Paige mouthpiece was dropped in favor of their own rubber mouthpiece with check valves. 1963-1966 Scuba. This model featured the new internal yoke screw, and a "balanced Venturi system" that directed a blast of air down the intake hose for easier breathing at any depth. There was also an "air deflector in the mouthpiece to prevent involuntary loss of air". 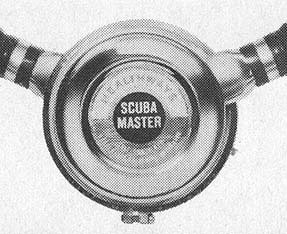 1965 Scuba Master. This two stage regulator featured a piston first stage, to deliver more air with no increase in effort. It was featured in the 1965 Healthways catalog, but unfortunately it was never even manufactured. I don't know of anyone who has ever actually seen one.